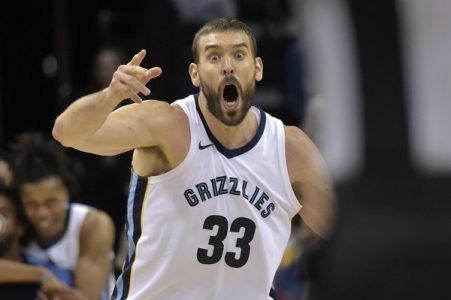 The Memphis Grizzlies finished with a 22-60 record last season (only the Suns with 21 wins had a worse record), so the team’s 12-8 start this year is a solid improvement. However, Memphis enters Friday night having lost THREE in a row. More worrisome is the fact that the Grizzlies have faded in the second half of each of those three contests. After blowing eight- and- nine-point halftime leads in losses to the Los Angeles Clippers and New York Knicks, the Grizzlies saw a 12-point halftime advantage disappear in Tuesday’s 122-114 loss to Toronto. The 8-14 Nets are coming off their worst offensive effort of the season in a 101-91 loss to Utah. Brooklyn shot 34.9 percent in losing its four straight. The Grizzlies have an outstanding duo in center Marc Gasol (18.5 & 9.4) and PG Mike Conley (20.3 & 6.6 APG). Gasol had 27 points on 10-of-14 shooting against the Raptors, while Conley added 20 points and six assists for Memphis, which shot over 50 percent from the floor for the sixth time this season but let Toronto go off at a 60.9 percent clip. While winning 12 of their first 17 games, the Grizzlies allowed 99.6 PPG on 44.8 percent shooting, while forcing 17.3 turnovers. However, in the team’s current three-game slide, Memphis has allowed 108.6 points on 45.7 percent shooting, while forcing a more modest 11.6 turnovers. The Nets are on a five-game home losing streak and a four-game skid overall, since a Nov. 20 win at Miami. During its five-game home losing streak, Brooklyn is averaging scoring 108.8 PPG but allowing 117.4 points on 49.7 percent shooting. Expect “the Grizz” to walk away winners, here.